In the mid-20th century, most Americans worried about atomic weapons. Today the fear of terrorism has replaced our fear of an atomic apocalypse…mostly. We consider terrorists foreigners. Of course there have been example of domestic terrorism and throughout American history a whole class of Americans were under the constant fear of domestic terrorists, vigilante injustice, lynching. 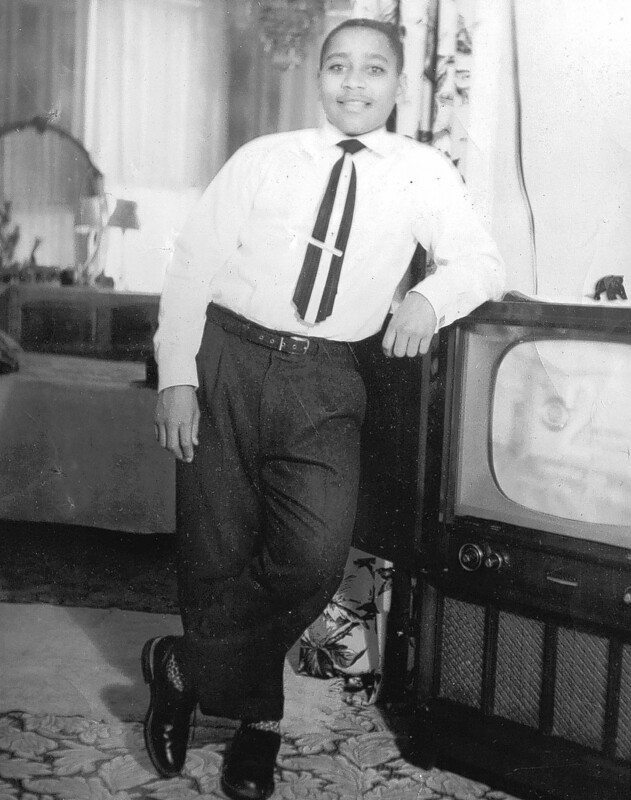 The story of Emmett Till is one of the better known examples of the thousands of black Americans who were mistreated, tortured, and killed by domestic terrorists. There are many articles and books about Emmett Till and the horrors that surround his final moments. 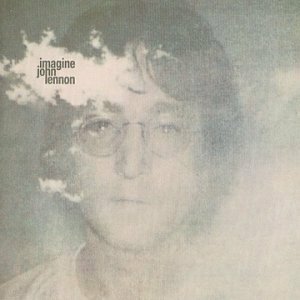 This piece is simply a chronological listing of his final days and the decades of injustice that followed. 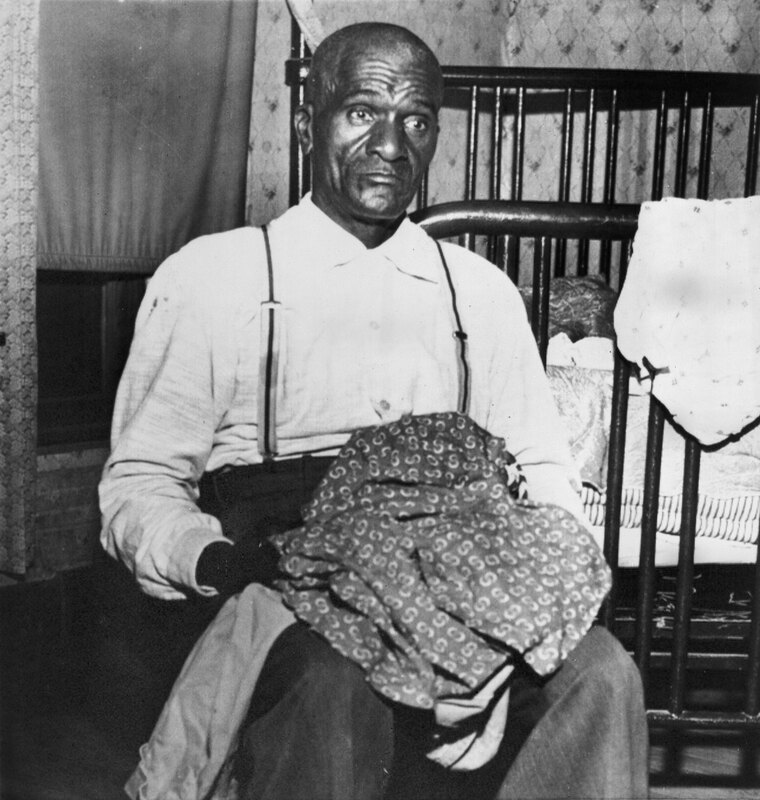 In early August 1955 Emmett Till’s great uncle Moses Wright had traveled from Mississippi to Chicago to visit family. At the end of his stay, Wright planned to take Till’s cousin, Wheeler Parker, back to Mississippi with him to visit relatives. Emmett learned of these plans he begged his mother to let him go along. Initially, Mamie Till said no. She wanted to take a road trip to Omaha, Nebraska and attempted to lure Till to join her with the promise of open-road driving lessons. 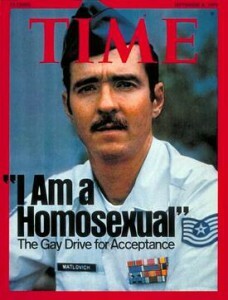 But Till desperately wanted to spend time with his cousins in Mississippi. She gave permission. August 19, 1955: Till’s mother gave Emmett his late father’s signet ring, engraved with the initials L.T. Louis Till had died in 1945 while a private in Europe during World War II. 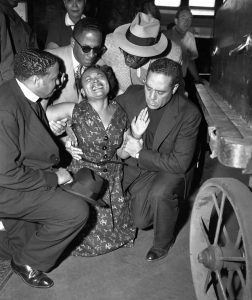 August 20, 1955: Mamie Till drove her son to the 63rd Street station in Chicago. They kissed goodbye and Till boarded a southbound train headed for Mississippi. August 21, 1965: Till arrived in Money, Mississippi to stay at the home of his great uncle Moses Wright. August 24, 1955: Emmett Till and a group of teenagers entered Bryant’s Grocery and Meat Market in Money, Mississippi to buy refreshments after a long day picking cotton in the hot afternoon sun. Till purchased bubble gum, and some of the kids with him would later report that he either whistled at, flirted with, or touched the hand of the store’s white female clerk—and wife of the owner—Carolyn Bryant. August 28, 1955: at approximately 2:30 AM Roy Bryant, Carolyn’s husband, and his half brother J.W. 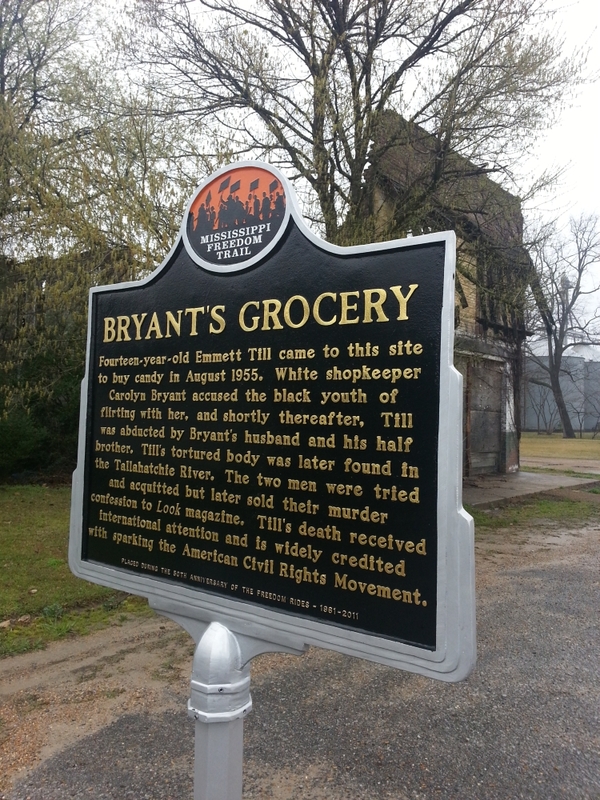 Milam kidnapped Emmett Till from Moses Wright’s home. 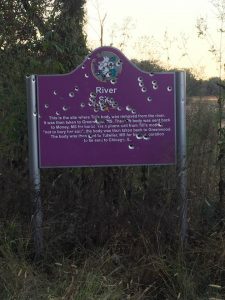 They then brutally beat, dragged him to the bank of the Tallahatchie River, shot him in the head, tied him with barbed wire to a large metal fan, and shoved his mutilated body into the water. Moses Wright reported Till’s disappearance to the local authorities. August 29, 1955: authorities arrested J. W. Milam and Roy Bryant on kidnapping charges. They are jailed in Greenwood, Mississippi and held without bond. August 31, 1955: Emmett Till’s decomposed corpse was pulled from Mississippi’s Tallahatchie River. Moses Wright identifies the body from a ring with the initials L.T. 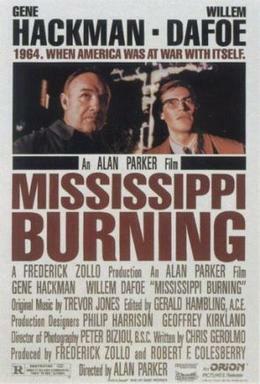 September 1, 1955: Mississippi Governor Hugh White ordered local officials to “fully prosecute” Milam and Bryant. 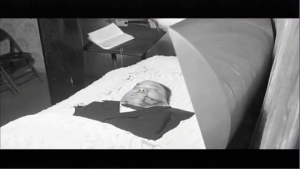 September 2, 1955: in Chicago, Mamie Till arrived at the Illinois Central Terminal to receive Emmett’s casket. Family and media surround her. She collapsed when she saw the casket. September 3, 1955: as mentioned above, in May the widow of Reverend George Lee had decided to have an open casket for her husband. Thousands waited in line to see Emmett’s brutally beaten body. September 6, 1955: Emmett Till was buried at Burr Oak Cemetery. 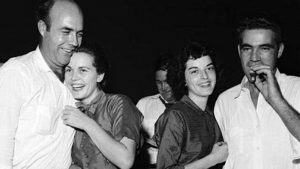 September 7, 1955: A Tallahatchie County grand jury indicted Roy Bryant and J. W. Milam for the murder and kidnapping of Emmett Till. Conviction on either charge could carry the death penalty. They both plead innocent and remain in jail until the start of the trial. 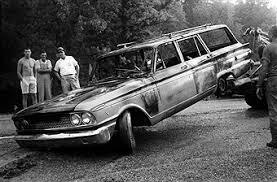 September 19, 1955: the murder trial (only) began in Sumner, Mississippi, the county seat of Tallahatchie County. Jury selection began. Law banned any blacks and all women from serving. The 12-man jury consisted of nine farmers, two carpenters and one insurance agent. 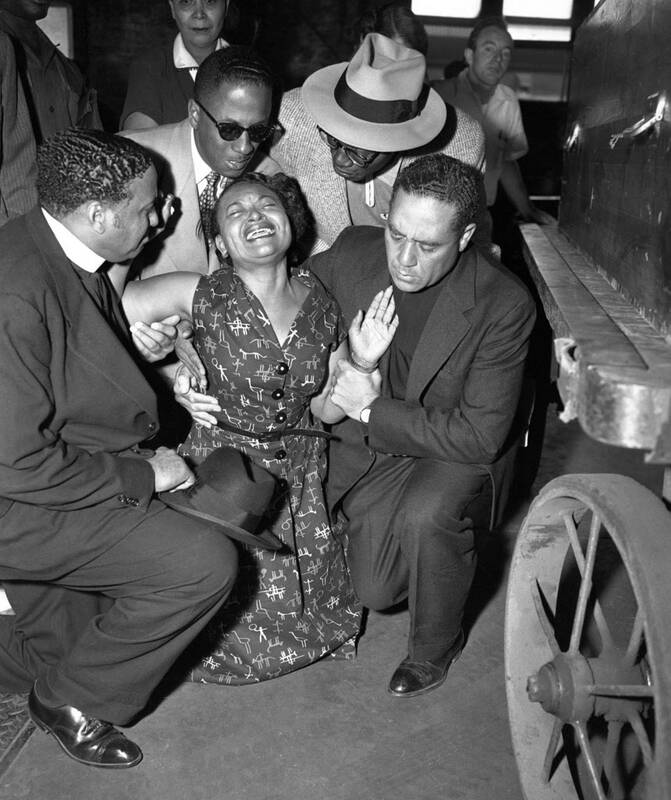 Mamie Till departed from Chicago’s Midway Airport to attend the trial. 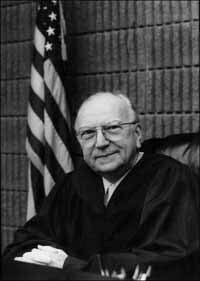 September 20, 1955: Judge Curtis Swango recessed the court to allow more witnesses to be found. It was the first time in Mississippi history that local law enforcement, local NAACP leaders, and black and white reporters had teamed up. They try to locate sharecroppers who saw Milam’s truck and overheard Emmett being beaten. 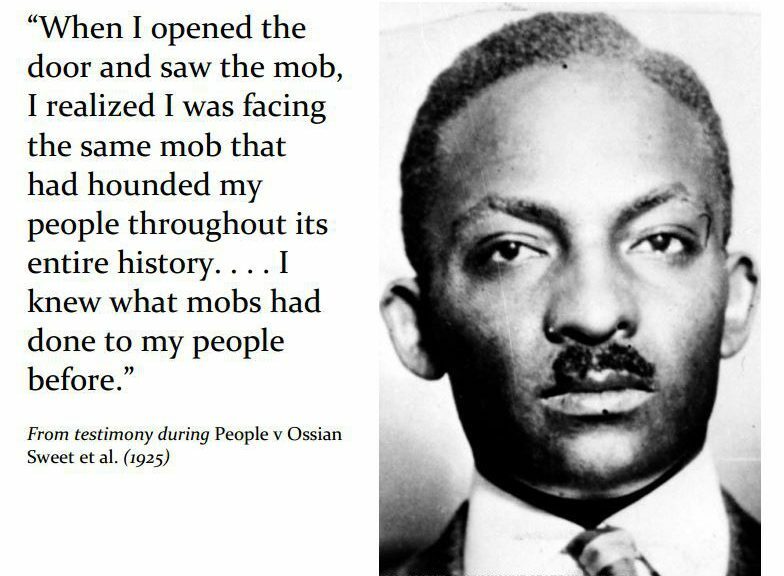 September 21, 1955: Moses Wright accused the two white men in open court, an unthinkable thing to do in that place at that time. While on the witness stand, he stood up and pointed his finger at Milam and Bryant, and accused them of coming to his house and kidnapping Emmett. September 23, 1955: after a 67-minute deliberation, the jury acquitted Milam and Bryant. One juror told a reporter that they wouldn’t have taken so long if they hadn’t stopped to drink pop. 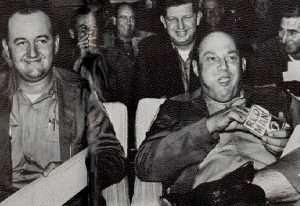 Roy Bryant and J. W. Milam stood before photographers, lighted up cigars, and kissed their wives in celebration. September 30, 1955: Milam and Bryant were released on bond. for the pending kidnapping charges. November 9, 1955: returning to Mississippi one last time, Moses Wright and Willie Reed testified before a LeFlore County grand jury in Greenwood, Mississippi. The grand jury refused to indict Milam or Bryant for kidnapping. The two men go free. January 24, 1956: an article by William Bradford Huie in Look magazine appears. 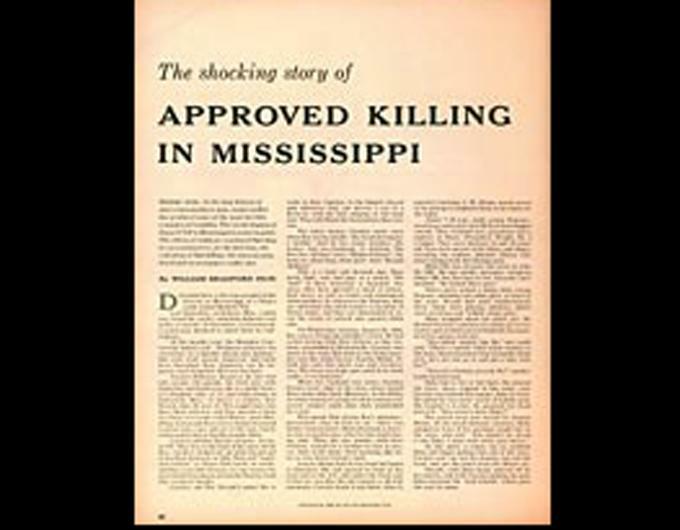 It is titled, “The Shocking Story of Approved Killing in Mississippi.” Protected by double-jeopardy, Milam and Bryant admit to the murder. They detailed how they beat Till with a gun, shot him and threw his body in the Tallahatchie River with a heavy cotton-gin fan attached with barbed wire to his neck to weigh him down. 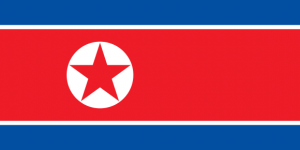 The two killers were paid a reported $4,000 for their participation in the article. 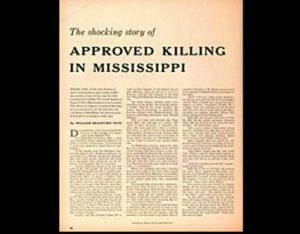 January 22, 1957: Huie wrote another article for Look magazine, “What’s Happened to the Emmett Till Killers?” Huie wrote that “Milam does not regret the killing, though it has brought him nothing but trouble.” Blacks have stopped frequenting stores owned by the Milam and Bryant families and put them out of business. Bryant takes up welding for income, and the community ostracized both men. E. Frederic Morrow moved to the White House on July 10, 1955. 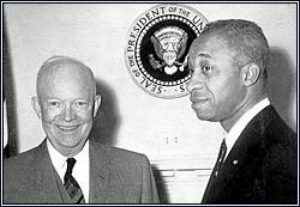 He was an aide to President Dwight D. Eisenhower and as such he became the first African-American to serve in that capacity. His autobiography vividly describes his difficulties in trying to persuade the administration to take a strong stand on civil rights. Morrow, for example, tried unsuccessfully to get President Eisenhower to issue a statement regarding Emmett Till’s murder. Morrow did, however, finally convince Eisenhower to meet with civil rights leaders in the White House, a meeting that occurred on June 23, 1958. December 31, 1980: J. W. Milam died in Mississippi of cancer. September 1, 1994: Roy Bryant Sr., 63, died at the Baptist Hospital in Jackson, Mississippi of cancer. January 6, 2003: Mamie Till Mobley died of heart failure, at age 81. Her death came just two weeks before The Murder of Emmett Till was to premiere nationally on PBS. February 23, 2007: in 2006 after a “cold case” investigation, Federal authorities had decided not to prosecute anyone, saying the statute of limitations for federal charges had run out. The Department of Justice said that the Mississippi authorities represented the last, best hope of bringing someone to justice. October 7, 2008: introduced in 2007, President Bush signed the Emmett Till Unsolved Civil Rights Crime Act of 2007. 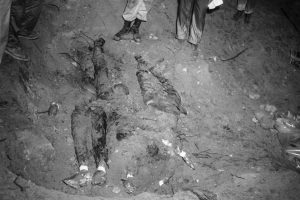 It tasked the Justice Department’s Civil Rights Division and the FBI with reviewing, investigating and assessing for prosecutive merit more than 100 unsolved civil rights era homicides. July 18, 2013: Willie Reed died. He had had changed his name to Willie Louis after the murder trial and moved to Chicago. Louis, one of the last living witnesses for the prosecution in the Till case, died in Oak Lawn, Ill., a Chicago suburb. He was 76. December 16, 2016: President Obama signed the Emmett Till Civil Rights Crimes Reauthorization Act of 2016. 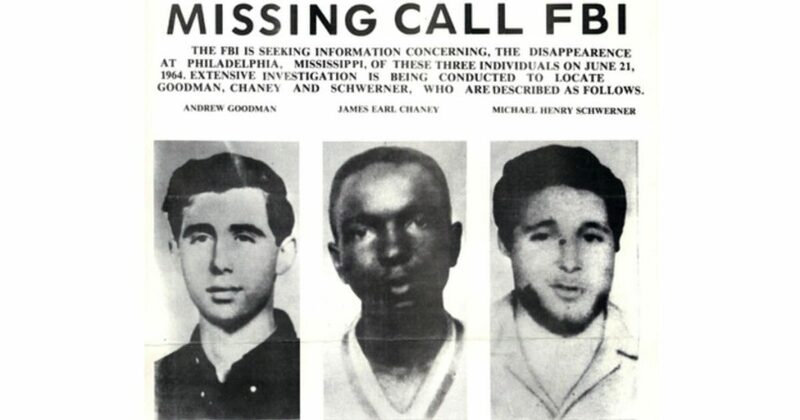 The Act allowed the Department of Justice and the FBI to reopen unsolved civil rights crimes.committed before 1980. The legislation is an expansion of a previous bill of a similar name signed into law in 2008. September 4, 2017: Simeon Wright died, Emmett Till’s cousin and the boy who was with Emmett whenRoy Bryant and his half brother, J. W. Milam kidnapped Emmett. It was Simeon Wright who donated a sample of his DNA to helping federal prosecutors prove that the disfigured body was actually that of his cousin. 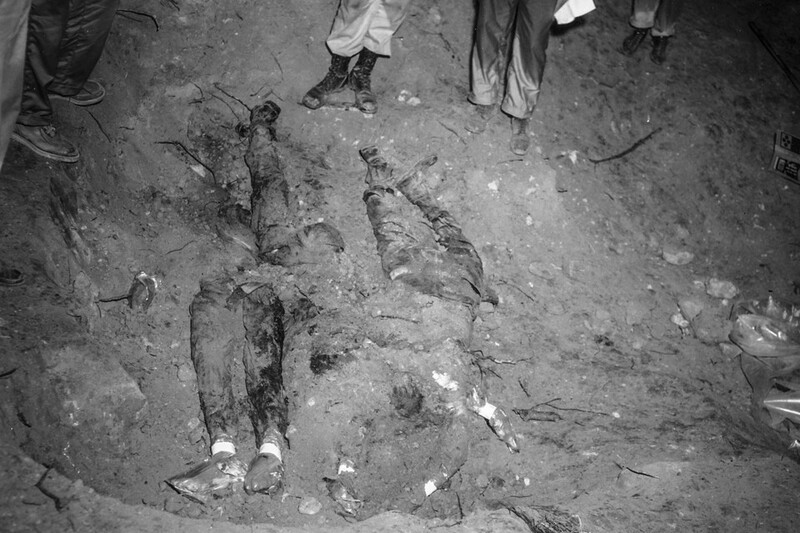 Bryand and Milam had claimed there was no proof that the body was Till’s. 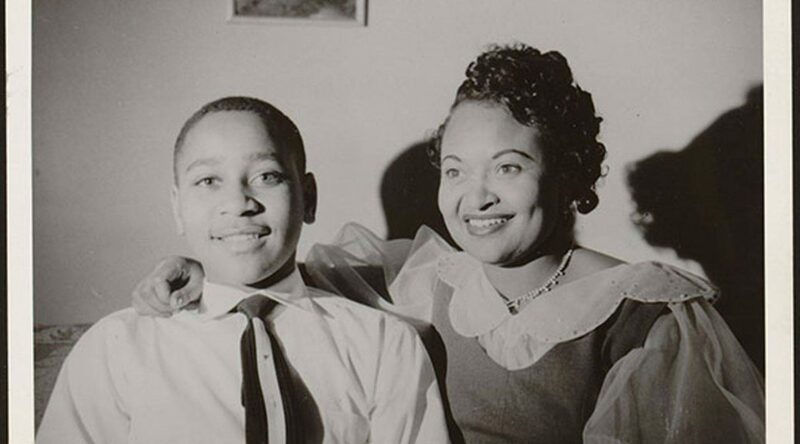 January 27, 2017: in a Vanity Fair magazine article, Duke University professor Timothy B. Tyson reported that Carolyn Bryant Donham (the woman who accused Till of inappropriate behavior) told Tyson that the story she and others told about Emmett Till was false. Tyson also wrote a book, The Blood of Emmett Till, about the murder. 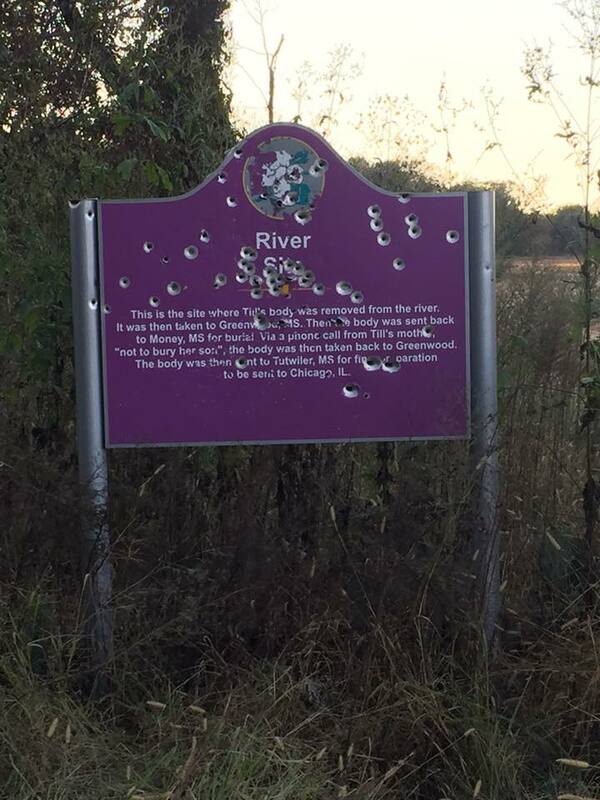 June 21, 2018: in 2007, eight Emmett Till historic signs were erected in northwest Mississippi, including at the spot on the river where fishermen in 1955 discovered Emmett’s mutilated corpse tethered to a cotton-gin fan. A year later, vandals tore down the sign on the riverbed. It was replaced. But then bullets were fired into that marker — more than 100 rounds over several years. 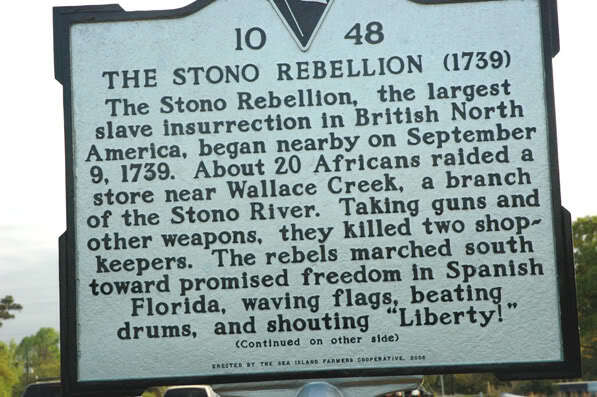 On this date, a new sign was erected. July 11, 2018: the U.S. Department of Justice announced that it had reopened its investigation into the Till murder. A report, sent to Congress in March, said it had received “new information” on the slaying. September 9, 1925: Dr. Ossian Sweet, an African-American, bought a house in an all-white neighborhood in Detroit and moved in with his family. 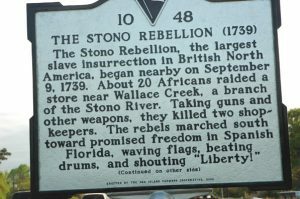 On this day, a white mob attacked the house, throwing stones and breaking upstairs windows. Dr. Sweet had asked nine other men to be in the house for protection, and some of them brought guns. 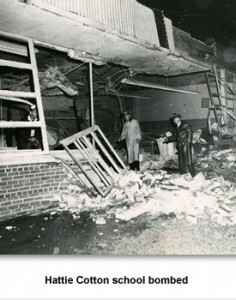 Guns were fired at the mob, killing one man and wounding another. Sweet and his friends were arrested and tried for murder. The first trial ended in a hung jury. When Henry Sweet, Ossian’s brother, was acquitted in the second trial, the prosecutor dismissed the charges against the other defendants. September 9, 1957: in September 1957 the public schools of Nashville, Tennessee, implemented a “stairstep plan” that began with a select group of first-graders and added one grade a year until all twelve grades were desegregated. Nineteen black first-graders enrolled in eight previously all-white schools. Organized white protesters, led by NJ segregationist John Kasper, appeared at most of the schools, but there was no violence. September 9, 1956: Elvis Presley made his first appearance on the The Ed Sullivan Show. Actor Charles Laughton hosted as Sullivan himself had recently been in a very serious car accident that left him in the hospital. Elvis was not on location in New York for the broadcast since he was in Los Angeles for the filming of Love Me Tender. When it came time for Elvis’ appearance, Laughton introduced him and then cut to the stage in Hollywood with Elvis. Elvis appeared with large, artistic guitars as decoration. 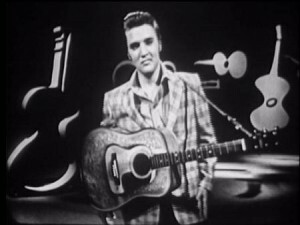 Wearing a plaid jacket and holding his guitar, Elvis thanked Mr. Laughton and then said, “This is probably the greatest honor that I’ve ever had in my life.” Elvis then sang, “Don’t Be Cruel” with his four back-up singers (the Jordanaires) followed by “Love Me Tender,” which was the not-yet-released title track from his new movie. September 9, 2010: Jones said, “As of right now, we are not convinced that backing down is the right thing.” That evening, President Obama calls Koran burning a “stunt,” and urges Jones not to go through with his plans. In a press conference with Musri, Jones says he will cancel the Koran burning event. During the conference Jones claims an agreement has been reached with Imam Feisal Abdul Rauf to move the mosque near Ground Zero and that a meeting has been planned with Jones and Imam Rauf on Sept. 11. Later reports quote Jones as saying, “We felt that that would be a sign that God would want us to do it…The American people do not want the mosque there and, of course, Muslims do not want us to burn the Quran.” Jones also states he is against any other groups burning Korans. September 9, 2016: Denver Broncos linebacker Brandon Marshall took a knee during the national anthem at the NFL regular season opener.